Stumbled across this a few days ago on my morning hike. Instantly memories crossed my mind of when my former co-workers used to catch bats in the warehouse, and put them in a box labeled. Do Not Open!!! It was only a matter of time before you heard a loud scream. 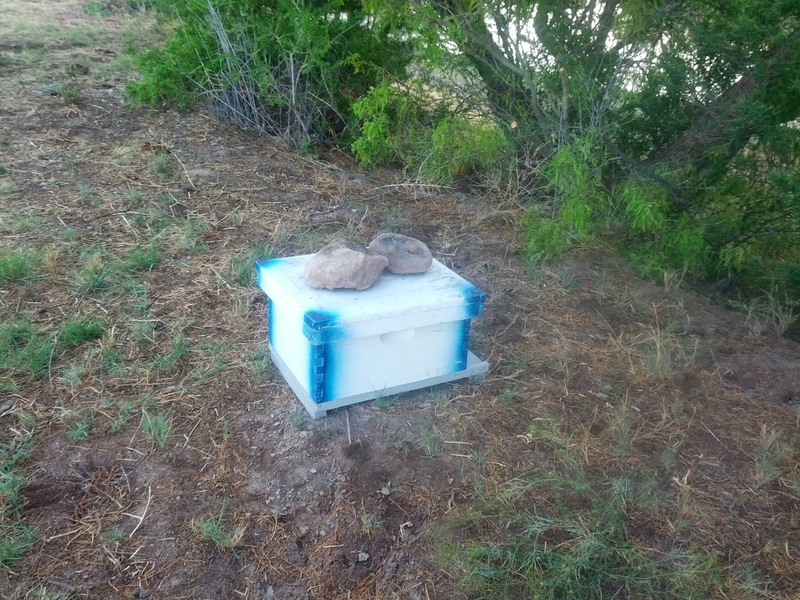 Surely a box with large rocks holding the lid on cant contain anything good inside. Think ill be moving on. The rest of my hike my mind was filled with the possibilities of what could be inside. Rattlesnake, gold, food, stolen loot, perhaps Forrest Fenn's hidden treasure just there for taking. Of course curiosity got the best of me as I passed by on my return hike. A little nudge couldn't hurt? Bee's hundred's of them immediately swarmed me. I took off running arms flailing all over the place. I am sure it was very good entertainment for any on lookers. Wondering what in the hell is wrong that guy? Ended up with several stings on my neck face, and ear. Would have been more but it was a chilly morning, and I was in jeans, and a jacket. I notified the park of the box of bee's, so they brought in this guy. Believe this is about the part where he was warning me "Stay Away there's bee's here I heard some fella got bit up good this morning" Thanks for the warning. Turns out he knew there was a hive in the area. Came in the park dropped off "What I now know to be plastic beehive " so he could capture them for his honey business. My current spot on the Rio Grande. Which is part of Caballo State Park, but located below the dam instead of where I was in a previous post. My new neighbors. Barb, and Katie from Me and My Dog ...and My RV. Pleasure to finally meet you! 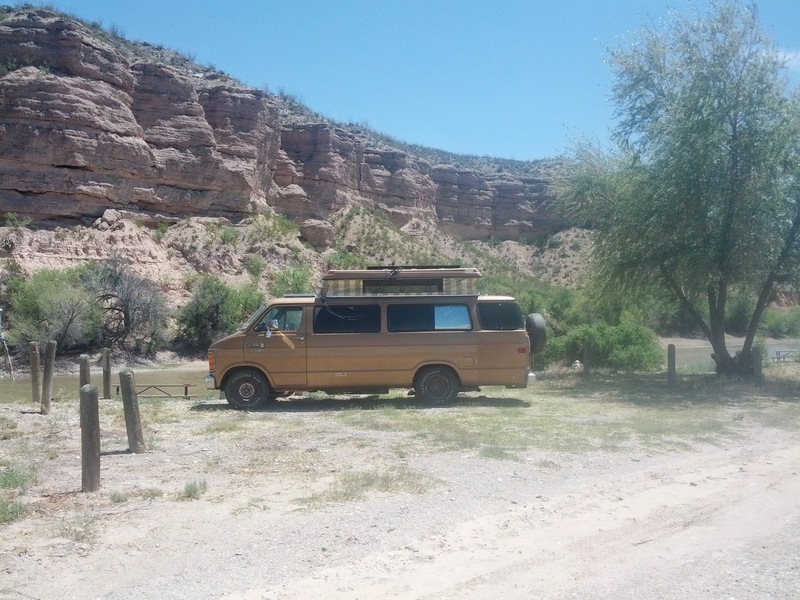 Perch flats at the entrance to the Rio Grande site supply a little more freedom if one desires. Although the Rio Grande has been real quiet Easter weekend was unbelievable with hundreds of people, but I cant complain my neighbor's children brought me hard boiled eggs, and hot dogs. 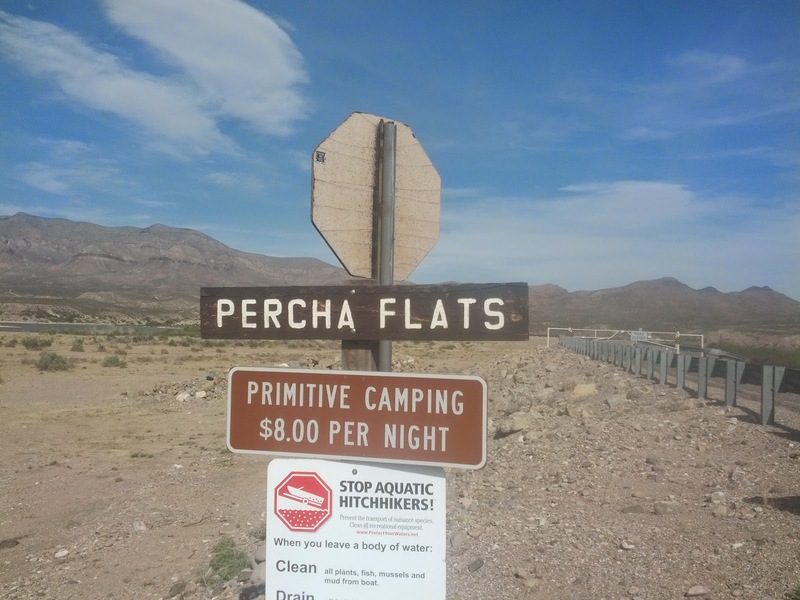 Percha Flats is a huge area for primitive camping. Tumbleweed on the dam. Caballo dam is almost a mile long. This guy/gal was sitting about 5 feet from "The Turtle" but of course by the time I got the camera he had moved on. Campground in the Cottonwoods from the dam. Thanks for visiting, and Good Day! I can't believe someone would put a box of bees there without a warning of any kind. I hope you are okay? Geez, that's just terrible. If you were allergic to bee stings that could have been very serious, especially walking by yourself. My neighbors left this evening and all is quiet down here. They left two smoldering fires, though. One in the rock fire pit and one in the metal grill thing. They were both smoking, but totally enclosed and looked safe. Always good to meet someone you've emailed or commented with - way cool! Strange about the bees, and you are right, could have been deadly if you were allergic. Glad you are okay and got it handled. Next time, we'll just say there are bees inside and keep walking. Thanks, Ill try to keep walking, but what if its gold? OUCH! I bet that was worse than those nasty no seeums we encountered at Scott's left some nasty scares on my ankles. But really that should have been marked hazard or something. Going to head out to Parker Canyon sometime this month, heard they cleaned it up some.